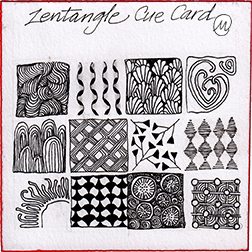 I was enthralled with the Legend card when I received my Zentangle Kit, and started making my own. I tried for a mix of tangles: grid and organic; dense and open. I love making them in their own right, and now I have a small collection of Legends and Cue Cards.